Kimberly Merle Schrier was born on August 23, 1968, in Los Angeles, California, the daughter of a public school teacher and an engineer. Her grandparents were Jewish immigrants from Europe who arrived in the U.S. prior to World War II. Schrier graduated from Palisades Charter High School and then earned a bachelor’s degree from the University of California, Berkeley, graduating Phi Beta Kappa with a degree in astrophysics. She spent a year working at the EPA before entering medical school at the University of California in Davis, where she earned her medical degree. She completed her residency at the Stanford University School of Medicine, and worked as a pediatrician in Ashland, Oregon, for one year before joining Virginia Mason Medical Center in Issaquah, Washington, in 2001. In 2013, Kim was named Best Pediatrician in the Greater Seattle Area by Parents Map Magazine. As the only woman doctor in Congress, Schrier has a unique perspective on health care. Through her own experience as a patient living with Type 1 diabetes, she understands the very real fear of health care costs and access for people living with pre-existing conditions. Schrier’s agenda is primarily about health care reform, but she also said she was inspired to run for office as a Jewish American after the neo-Nazi march in Charlottesville, Virginia, in August 2017. 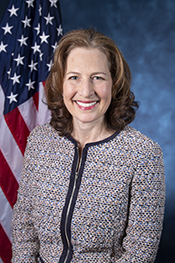 In the 2018 elections, Schrier ran in Washington’s 8th congressional district to replace incumbent Dave Reichert. She won with 52% of the vote. Schrier and her husband, David Gowing, have a son and live in Sammamish, Washington.